All Scuba Solutions is located in Thong Sala on the island of Koh Phangan in the Gulf of Thailand. 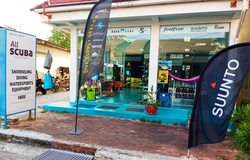 It's aim is to provide the Island with an expansive range of Scuba Diving, Snorkelling, Water Sports Equipment, Scuba Equipment Servicing and More. We stock all major brands and are dealers for Aqualung, Scubapro, Suunto and Feel Free.. Available Colours: Light Gold, Copper, Blue, Black White, Lime , Pink, Gray, Ocean, Sakura & Sun. All Scuba solutions is the only dedicated Scuba Diving Equipment and Water Sports Equipment supplier on Koh Phangan. we are an independent retailer supplying most of the major brands available in Thailand. We stock Scubapro, Aqualung, Mares, Suunto, Technisub, Seac Sub, Cressi Sub, Saekodive, Deep Blue, Ocean Dynamics, Intova, Feel Free and more. In addition to retail we are also open for wholesale enquiries. SCUBAPRO offers a full product range of scuba diving regulators, buoyancy compensators, masks, fins, snorkels, wetsuits and Lycras as well as scuba accessories. Some of SCUBAPRO’s flagship products include the MK25 / S600 regulator, the world famous Jet Fin and the latest line of Force BCDs. Aqualung is a worldwide leader in SCUBA diving equipment. Manufacturing high performance regulators, buoyancy compensators (BC's), masks, fins, snorkels, wetsuits and many more products to make your diving adventure safe and memorable. Suunto is a leading designer and manufacturer of sports precision instruments for SCUBA diving. Prized for their intuitive design, accuracy and dependability, Suunto’s precise instruments combine the aesthetics and functionality of watches with diving-specific computers that help divers at all levels enjoy their diving experience safely. Mares have been manufacturing Scuba diving equipment 60 plus years and are leaders in SCUBA diving equipment design. Producing innovative regulators, buoyancy compensators, masks, fins, snorkels, wetsuits and diving accessories. Mares continue to strive towards improved design and innovative technology. Seac Sub is certainly a firm that sets benchmarks in the diving sector a strong point that cannot be overlooked is the balance between quality and price. Seac Sub’s full range of diving equipment offers excellent value for money. Saekodive designs, builds and markets various kinds of high quality diving equipment including masks, snorkels, fins, knives, retractors, wreck reels, lights and many other accessories. The Saekodive price range is very competitive. Deep Blue is a local brand producing quality low cost snorkel sets, diving masks, fins and snorkel. These products are perfect for those on holiday, snorkel tour operators or dive centres. Intova produces affordable digital camera and housing sets and underwater torches for the diver and in conjunction with it’s partner company Snapsights disposable cameras ideal for snorkeling, kayaking and general outdoor activities. Feel Free is a Thailand based producer of high quality waterproof bags with the very successful dry tubes and dry tanks being most popular. All Scuba Solutions is the Official Dealer for Feel Free Waterproof Bags on Koh Phangan. If you need any information or equipment whilst on Koh Phangan please either call by to see us in Thong Sala, Koh Phangan or call us on +66 (0) 922120196 or e-mail us at info@allscubasolutions.com or visit our contact us page.